Consider replicating the Middle Earth Walking Challenge Wellness Program at your library, using the tips and resources provided by the Peter White Public Library of Marquette, Michigan. 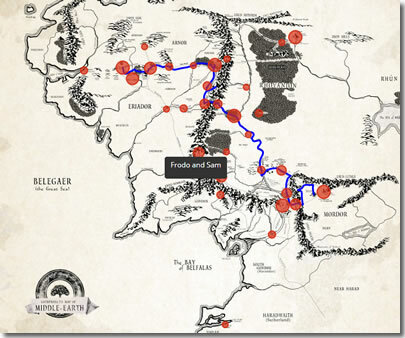 Participants were challenged to save Middle Earth by walking from the Shire to Mt. Doom, with the goal of destroying the One Ring. Participants kept track of the miles they walked from June until August. The winner received a copy of The Lord of the Rings, and runners-up received a copy of The Hobbit. We also got a lot of TV exposure early in the program. In terms of generating excitement about a library event and promoting fitness, I think our goal was achieved. ... the buzz generated at the beginning of the summer and the positive feedback from the people who completed the task was great. The winner walked 963 miles, a little over half-way to Mordor. Collectively, we walked 4,642 miles, thus saving Middle Earth. If I were to do this type of event again, I would make it less labor-intensive for participants. I think keeping track of miles every day over the course of the summer was just too much work. If the challenge lasted just one month, more people may have completed it. We spent money on printing ($.05/color copy) and prizes. The prizes were nine copies of "The Hobbit" and one boxed set of "The Lord of the Rings" trilogy, which came to approximately $114. You can download from the post a mileage Walking Log and a copy of the poster they used to promote the activity. The Walking Log indicates it's 458 miles from Hobbiton to Rivendell, and 920 miles through Moria to Lothlorien.